OK, so it was stunning 60 years ago. But Ampex, which pioneered audio and video tape recording, is still with us. 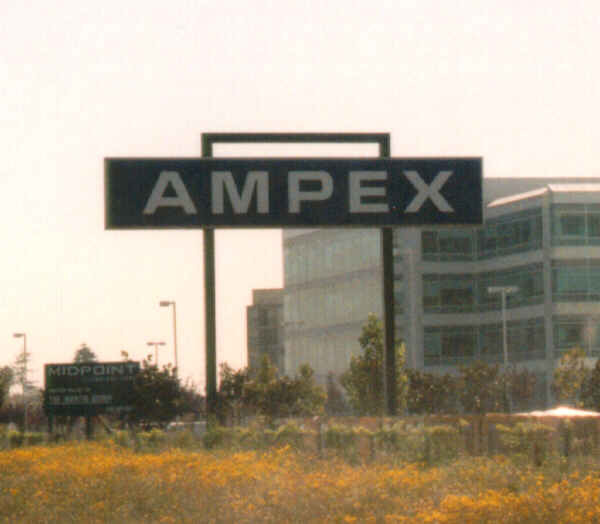 And so is the towering Ampex sign honoring the company’s history. You’ve seen it just off Highway 101 in Redwood City. Last week, Ampex filed for Chapter 11 bankruptcy. Its head count is down to 101 from a long-ago peak of 12,000. Its shares are trading at about 40 cents. Watching Ampex is like watching some beloved relative stagger and wheeze and shuffle around the house. And so I’m declaring today Ampex Appreciation Day. I actually knew nothing about Ampex before reading this article. I’ve seen their sign from the freeway plenty of times, and often wondered what they did. I never remembered to check when I got home. More about Ampex at Wikipedia. When I was recording a lot of cassette audio tapes in the 1980s, Ampex was one of many brands of blank cassettes I purchased. So I had heard of the brand long before I visited California and saw their sign along 101. I was also somewhat familiar with their pioneering role in the history of audio recording, but I didn’t know that they were also the ones that developed the helical scanning head.